Congratulations to Ashkan Razavi, Winner of Event 9: $1,500 No Limit Hold'em Re-Entry ($781,398)! Five days ago a uniquely structured event began that allowed tournament runners who busted on the first day a second chance. When all was said and done, the event turned up an astounding 3,404 entrants. After five days of play, Ashkan Razavi was the lone man standing, earning him $781,398 in prize money and a shiny gold World Series of Poker bracelet. Day 1a of this event turned out a total of 1,696 players while the second flight saw 1,708 players return to the felt. With a field this size, the number of notable casualties were through the roof. Just a small sample size of the names who played in either flight of the Day 1's and were not able to return for Day 2 play include: Yevgeniy Timoshenko, Steve O'Dwyer, Gavin Smith, Andre Akkari, Vanessa Selbst, Chino Rheem, Dennis Phillips, Carlos Mortensen, and many, many more. After two long flights, the final 514 players advanced to Day 2, where only the top 342 would cash. Among those to make it through the grueling field and cash in this event are Sam Barnhart, Mickey Petersen, Angel Guillen, Jason Mercier, Jason Koon, Mike Mautsow, and PokerNews' own Kristy Arnett. Even with a field this large, the cream would still rise to the top. Many notable names were able to push through and make Day 3, including Scott Seiver, Paul Wasicka, Daniel Idema and 2010 WSOP Main Event champion Jonathan Duhamel. Unfortunately, Day 3 was as far as those players were able to make it. By the end of the third day of play a final table was set and there was a chance for history to be made. The story on everyone's lips was that of Amanda Musumeci, who came into the day as the last woman remaining in the field. Musumeci had the opportunity to become the first woman to win an open event since Vanessa Selbst won Event 19 - $1,500 Pot-Limit Omaha in 2008. Also at the final table was the winner of Event #55: $50,000 Poker Player's Championship at the 2011 WSOP, Brian Rast. 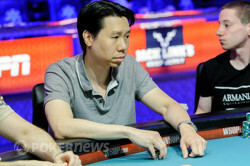 The final table kicked off to a lightning pace when Dien Le was crippled by calling the all in of Derrick Huang. Le's pocket eights were unable to best Huang's king-queen and he hit the rail soon after. Immediately after, Benjamin Reinhart got in a raising war with Amanda Musumeci that led to Reinhart five-betting all in with . Unfortunately for Reinhart, he was behind the of Musumeci and failed to improve. With this bust, Musumeci was able to accumulate enough chips to vault her into the chip lead. The next hand saw another casualty when Greg "FBT" Mueller moved all in from the cutoff holding only to find that Derrick Huang was holding pocket kings. Mueller found hope on the flop, giving him backdoor diamond outs and a jack to make Broadway. The turn and the river bricked out, however, and Mueller was sent home in seventh place. Brian Rast was never able to gain any momentum at the final table, and he was the next to go when he moved in holding but was crushed by Ashkan Razavi's . 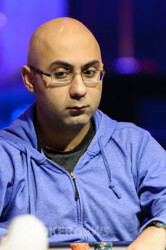 Rast's weren't the only chips that Razavi would collect, however, as a bit later Duy Ho moved all in for roughly 3,700,000 holding pocket threes against Razavi's pocket kings. The kings held and Razavi had a choke-hold on the competition. Ryan Olisar was the chip leader coming into the day, but ended up as the fourth place finisher. Both he and Musumeci got it all in when they were almost even in chips. Olisar held and was racing with Musumeci's . Musumeci struck gold on a board and sealed the deal when the came on fourth street, giving her a full house. Olisar was left to be forced all in while in the big blind during the next hand and was finished off immediately. The final casualty before heads up play came when Ashkan Razavi opened the betting to 200,000 and Derrick Huang announced an all in from the small blind. Razavi instantly called with and was crushing Huang's . The kings were able to hold and just like that we were heads up. Razavi had a huge chip advantage going into play, but that did not deter Musumeci from continuing to fight until her last breath. Musumeci managed to double up once when she won a race in dramatic fashion. Just like that Amanda Musumeci became the second place finisher, pocketing $481,643 for her efforts, which is her largest lifetime cash to date. 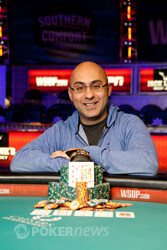 PokerNews would like to extend its congratulations to the newest WSOP champion, Ashkan Razavi. This concludes our coverage of Event 9: $1,500 No Limit Hold'em Re-Entry. In case you missed it, check out the coverage of the Event 11: $1,500 Pot Limit Omaha that also crowned a champion today. The final hand of Event 9: $1,500 No-Limit Hold'em Re-Entry at the 2012 World Series of Poker has been dealt and it went a little something like this. Ashkan Razavi opened to 200,000 from the button and Amanda Musumeci decided now was the time to shove her short-stack all in. Razavi thought for just a few moments before making the call, prompting both players to turn their hands over. The players were on their feet, the rail was in their feet, the excitement was building. The dealer turned over a flop. Razavi hit his ten and Musumeci would need some help. The on the turn was no good and it was looking like it was about to be all over. Another pair for Razavi and that was it for Musumeci. For her 2nd place effort, Musumeci received a bittersweet $481,643. 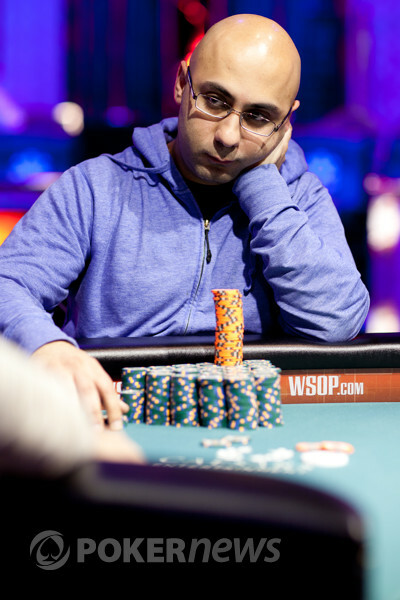 And with that, Ashkan Razavi wins his first WSOP gold bracelet. Ashkan Razavi has just taken a huge pot to again be out in front by a ridiculous amount of chips. The hand started with Amanda Musumeci opening the button to 210,000. Razavi called in the big blind and a flop would be dealt. Both players opted to check the flop and the would hit the turn. This time Razavi would check and then call a bet of 305,000 from Musumeci. The on the river would see Razavi lead for 470,000. Musumeci then took her time before raising it up to 1,025,000. Sensing weakness or perhaps knowing he had the best of it, Razavi raised it up to 1,675,000. Musumeci didn't like the sight of this bet, immediately sliding her cards into the muck and sending the huge pot to Razavi. After several hands of raises preflop taking the pot down, Ashkan Razavi raised to 200,000 from the button and Amanda Musumeci announced that she was all in. Razavi quickly announced a call and the rail went absolutely nuts. The flop brought nothing but backdoor draws for Musumeci, coming . The adrenaline quickly started pumping, however, when the came on fourth street, giving Musumeci any jack, seven, ten, or diamond for a win. Musumeci was able to make her diamond flush and double up through Razavi, keeping her hopes of being the first woman to win an open event since Vanessa Selbst won a bracelet in 2008. The play slowed down for several orbits, but that has all changed with the elimination of Derrick Huang in 3rd place. His last hand began when Ashkan Razavi opened the pot to 200,000 from the button. Huang was in the small blind and moved all in. Razavi instantly called and turned over . 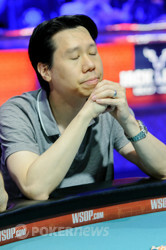 Razavi's cards hitting the felt was enough to see Huang let out a sigh and give his head a slight shake as he turned over . Razavi's rail got on their feet and so did the two players in the hand as the dealer dealt out a board. With that, Huang goes home in 3rd place for a $347,228 score, while we are down to heads-up play here in Event 9 of the World Series of Poker. Folded to Derrick Huang in the small blind, he announced he was all-in. 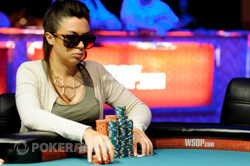 It was around 1,300,000 to Amanda Musumeci in the big blind and she quickly called. Huang would need some help or we would be down to heads-up play here in Event 9. The flop was good for Huang and the gave him two-pair, but it also gave Mucumeci outs to the straight. Any seven or eight on the river would eliminate Huang, however it was a safe and Huang took the double-up. Amanda Musumeci opened to 255,000 from the small blind and Ashkan Razavi called from the big blind. The flop fell and Musumeci continued with a bet of 285,000. Razavi slid out a call and the came on the turn. Musumeci opted to check on this street, paving the way for Razavi to bet 310,000. Musumeci folded to the bet and Razavi took down the pot.